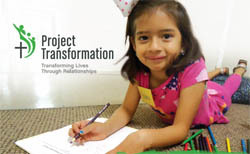 Suncreek UMC has been in partnership with this amazing ministry for over 17 years. We provide financial support for a college summer intern, provide meals for the 100 plus college interns twice a summer, and provide financial support for the electric bill for Elmwood UMC in West Dallas which is our host site for this ministry. We also participate in a reading week with our host church. During this week volunteers from Suncreek UMC can engage in one on one interaction with the wonderful children in this program and help them work on their reading skills. If you are interested in learning more or signing up for our reading week please contact Janet Hunt in the church office. If you’re new to Project Transformation, the easiest way to understand how they live out their mission is remembering the three C’s: Children, College students, and Churches. Since our founding in 1998, this ministry has been addressing three unique challenges with one program: 1) how to meet the academic, physical, and spiritual needs of children from low-income communities, 2) how to provide meaningful ways for college students to explore ministry opportunities and develop as young adult leaders for the church and the world, and 3) how to help revitalize struggling urban churches.